MogoBlog MogoLicious Tasty Tip of the Day: Just look at this beautiful work of art: It’s a cake, it’s a brownie and it’s even a freaking sundae. It’s the perfect dessert for the Type-A personality in us all. Place the butter and chocolate chips on the mug you are goin to make the cake and microwave for a total of 45 seconds but you have to stir it every 15 second intervals (so a total of three stirs). In another bowl, whisk together the egg, vanilla essence, and coffee powder. When the chocolate is melted in your mug, stir in the sugar and cocoa powder. Stir in the egg mixture. Then stir in the flour mix. Stir to eliminate lumps. Microwave the mug for 30 seconds. Stir. Microwave for another 30 seconds. The cake will rise to the top of your mug like a soufflé. Take out and press in the chocolate down into the centre of the cake. Microwave further for 30-35 seconds. Let the cake cool while you prepare the toppings. Melt the chocolate in the microwave by heating for 20 second interval, stirring between each, until melty. I had to keep only for two twenty seconds interval. Place two scoops of icecream on top of cake. Drizzle the caramel sauce, the chocolate sauce and the crushed nuts on top. You can add crushed biscuit, and whipped cream too. Even though you are adding coffee powder, there won’t be any coffee flavor. It only enhances the chocolate flavor. You can use any flavor ice cream you like, but what would go well with the cake according to me are pralines n cream, cookies n cream or vanilla flavor. Whipped cream can be used as a topping too. Make sure you push the chocolate deep into the cake until it is fully covered. I didnt do that so, it was seen as a dent on top after baking. Please note that the cooking time will depend on the microwave wattage. The key for perfect mug cake is that you dont overcook the batter. The cake should rise a bit, ideally with a fluffy, moist, gooey texture and glossy top. The more you will cook, the more the cake will harden up and dry-so slightly undercook and keep an eye on them all the time. 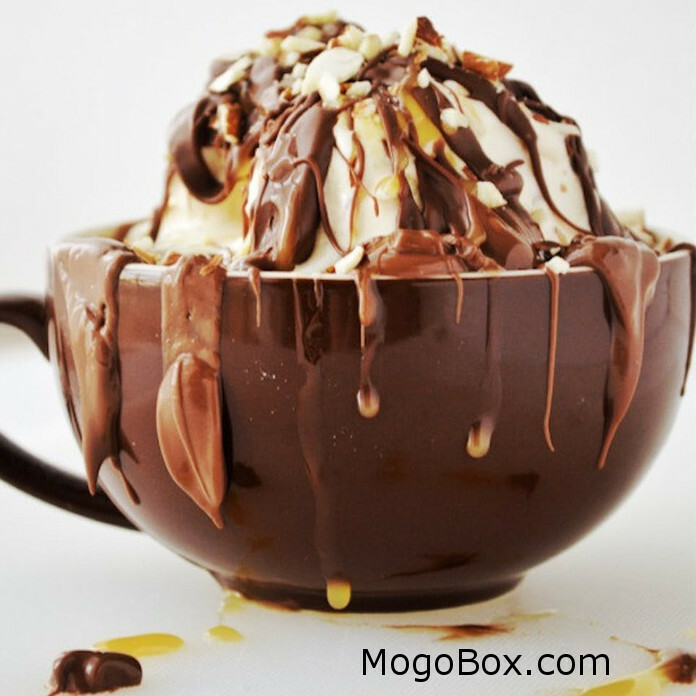 This entry was posted in MogoBlog, MogoLicious and tagged #MogoBlog, Brownie, Cake, Ice Cream, MogoBox, MogoLicious, Mug Cake, Sundae.